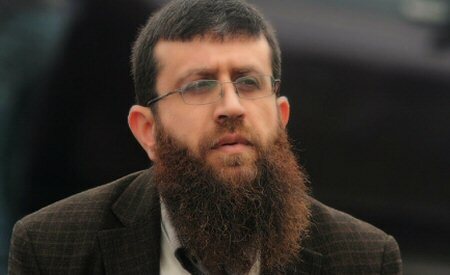 The military occupation court in Salem camp, west of Jenin, in the northern occupied West Bank, on Wednesday, extended the detention of Islamic Jihad leader Sheikh Khader Adnan for the 24th time in a row. Al Ray sources reported that the court extended his detention without charge or trial until the 8th of next month, on the pretext of completing interrogation, during which he was detained in Megiddo prison and then transferred, suddenly, to the detention center of Raymond Sahrawi. Sheikh Khader was taken into custody in 2017, after a raid on his house by Israeli occupation forces; he is married and has six children; previously detained in the prisons of the occupation under eleven arrests, and spent eight years in administrative detention. He is one of the pioneers behind the staging of individual hunger strikes against administrative detention; he was on strike for 66 consecutive days, and another for 55 days, before he was released.